Legistek is not just a legal software company. Legistek is a legal solutions company. 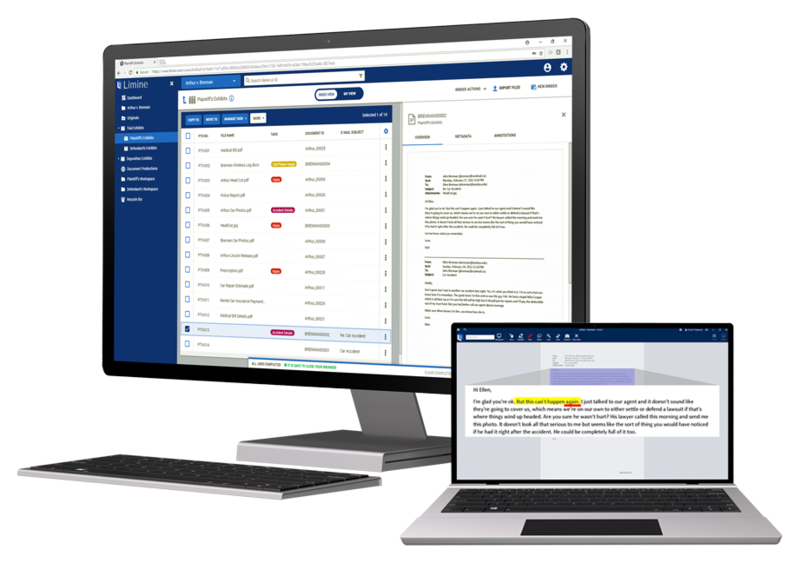 Developed together with Epiq, our product, Limine, is an integrated evidence organization and presentation platform that at last bridges the gap between e-discovery and presentation, supporting case teams all the way through trial and beyond. Limine gives you all the tools you need to collaboratively manage your evidence at every stage of litigation after document discovery is complete. One you've imported your production documents (including metadata, native files, and extracted text), you can sort, organize, and search exhibits; automatically apply realistic exhibit stickers and supplemental brandings; export labeled, branded, and redacted PDFs; manage and edit videotaped depositions; and create and maintain exhibit lists. Access your evidence from any web browser or use Limine’s powerful desktop client to download your materials for offline work. Share materials with colleagues and regulate access for specific individuals or teams with matter- and content-level permissions. Present evidence anywhere a TV or projector is available, from high-level review meetings with partners or clients, to depositions, witness preparation, hearings, arbitration, mediation, and of course, the jury trial. Limine is simple enough for an attorney who just wants to load a few PDFs and present them from a tablet. But it's also powerful enough to meet the needs of large trial teams and world-class litigation service providers, with advanced load file import and field mapping functions, bulk metadata and field value editing, state-of-the-art security, a vast array of deployment options including cloud-hosted configurations, and full support for the latest and greatest computing platforms—including Windows 10 and compatible touchscreen devices. For virtually any post-production need, any style of workflow, and any experience level, legal presentation begins in Limine.